Any Pacific Seacraft 34/37/40 owners out there that had the Pacific Seacraft factory custom-made fiberglass hardtop dodger with handrails and Stratoglass windshield installed? If yes, can you please post any photos you have? I'm interested in seeing the finished product before I decide to have them build me one. Thanks! Hey KBBARTON,I do not know if this is what your are referring to but I think that Pacific Seacraft installed this hard top on our PSC-34. These pictures are pretty busy, but if I can take some better flicks if you are interested. Other than catching my forehead from time to time I really appreciate the shelter and HANDHOLDS. Yeah, I think that is it... or something very similar. Thanks for posting those pics! Do you need any more flicks or comments? Are you happy with the protection it provides? The glass enclosure only covering the companionway seems like that's a bit too narrow? It's the first time I see this - I had no idea Pacific Seacraft makes these. I really don't mean to be critical, but that hard set up looks odd. My first thought is that I'd want a dodger to dodge spray from the cockpit, not just the companionway. A soft dodger that went all the way to the side of the cabin would be my first attempt. If I was paying the bucks for a hard dodger, I'd try to design the same, with hard plexi windows that are clearer anyway. It looks like getting purchase on the cabin top winches might be the issue. If that's the case, a cut away, swing away or zip away is often engineered into the conflicting canvas or plexi. Some just accept a half swing on the winch. The enclosure / dodger is constructed from regular clear plastic, possibly isinglass. 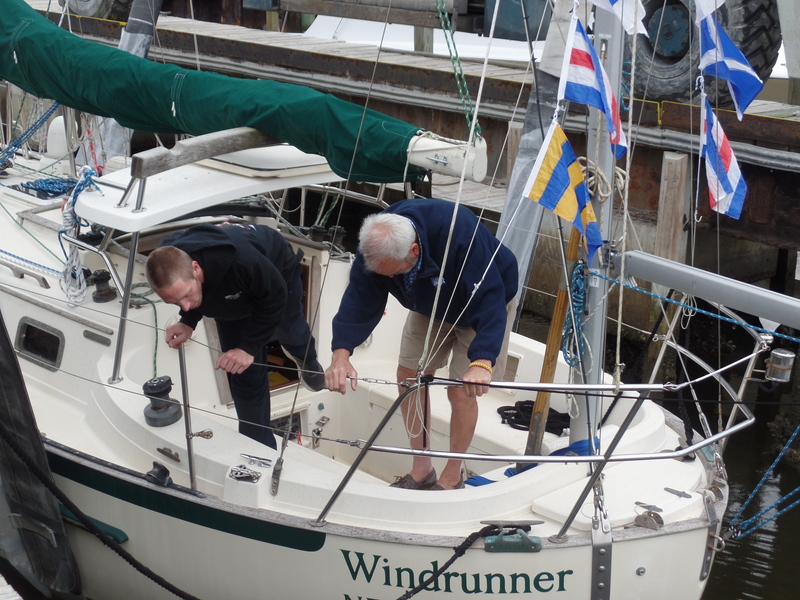 The starboard side does zip off to improve access to the winches. The starboard coach roof winches are used for the main sheet, when there is a bunch of wind, reefs, and the starboard staysail sheet. I have not found it a problem leaving the panel rigged. There are also two aft panels, not shown, one of clear plastic and another with a screen/sun shade. The boat was thoughtfully set up for single handling by the PO. I think that he added the mizzen, tiller, boom gallows and hard top. He also fabricated a braced seat that sits on top of the bottom drop board. The enclosure completely shelters the seat and one can see the radar and chart plotter displays at the nav station. The depth, speed, wind and auto pilot instruments are all also in easy view at the aft end of the cockpit. The tiller is just in reach from the seat. I rode out the past hurricane at our slip with all the panels in. The arrangement provided good shelter and observation. I suspect that the set up would be excellent for ocean crossing. (However) It is a little awkward for bumming around the Pamlico, especially the depth display being behind the helmsman and the chart plotter pretty much outta sight for my old eyes. A couple of weeks ago I was sailing with an apparent wind gusting at times over 30 kts in the sound. Spray was coming over the hard top. 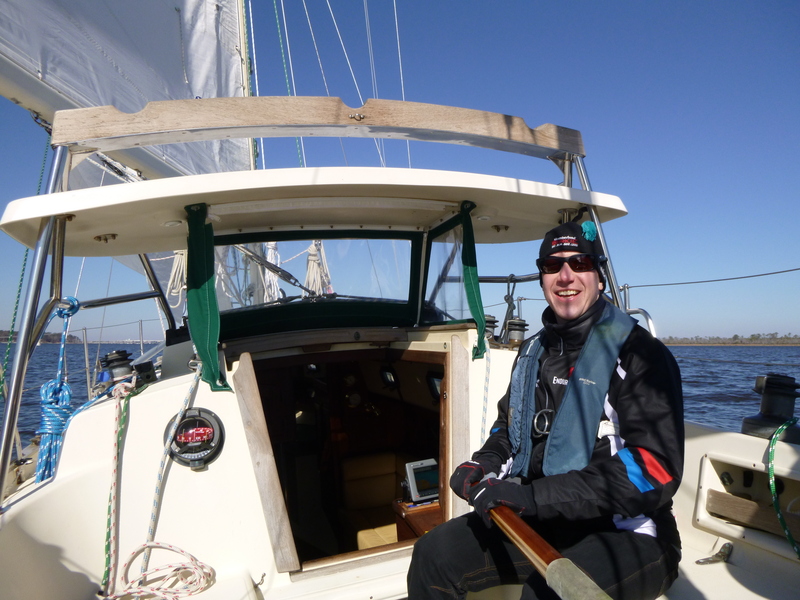 I stayed fairly dry standing behind the companionway catching a bit of spray between the hard top and the boom gallows when I stood up to see ahead. With this set up, the handholds are most beneficial, followed by spray protection and the boom gallows. The PO also had twin hank on head stays complete with a nice inventory of head sails. They have been replaced with a mid size yankee on a roller furler. The mizzen boom was not compatible with the self steering wind vane and me maneuvering in our marina. Both are presently off the boat. Again I purchased the boat this way, and it ain't too bad, especially since it is paid for. 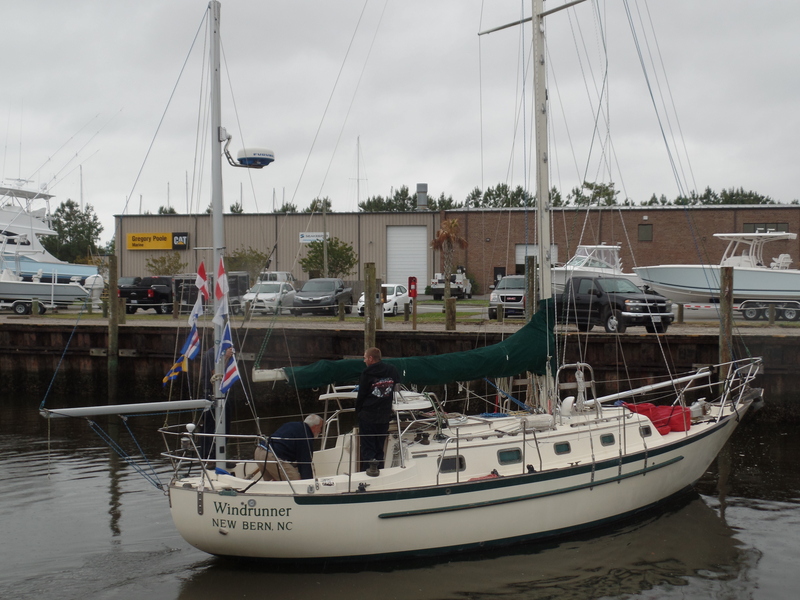 I have certainly enjoyed sailing her about 58 days in the 9 months that she has been in the water. Last edited by [email protected]; 3 Weeks Ago at 08:19 AM. Something to love about all boats. Glad you enjoy her. Cheers.